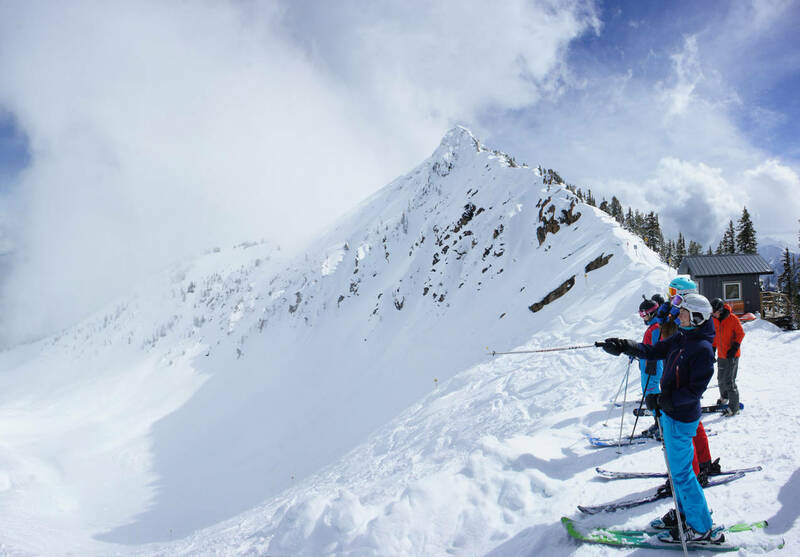 Kicking Horse is an awesome mountain for advanced skiers and riders with its four large upper bowls and over 85 numbered (on the trail map) in-bound chutes. 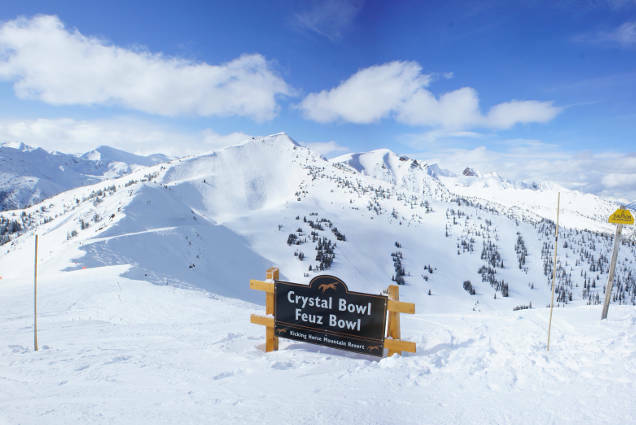 There is plenty of beginner and intermediate terrain at the lower elevations, but it is the terrain in the upper four bowls which excite most visitors. Low attendance with massive terrain allow one to explore and often get fresh tracks. 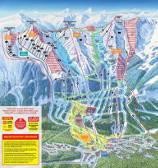 Kicking Horse has the fourth highest vertical in Canada from top to bottom. The gondola is an essential option on colder days and carries passengers from the base to the center peak of the mountain. From this peak one can access the two bowls on either side. Kicking Horse is located three hours West of Calgary Alberta Canada just outside of the town of Golden British Columbia. While this resort is located beyond the more popular Banff area resorts, in no way does it lack the facilities associated with civilized life. Modern lodging, rental shops and dining establishments are all available at the base of the mountain and in the town of Golden. Visitors from the US or other foreign countries must remember that a passport is required for entry into Canada by air or by land. A visa is not required for Americans or Europeans (Canadian visa details). A driver's license or any other form of ID will not get you through. Your passport will also be required to return. When driving, this can result in a delay. I was stopped at the border for further questioning and had to wait an hour and a half just to be asked the same questions and then allowed to enter. 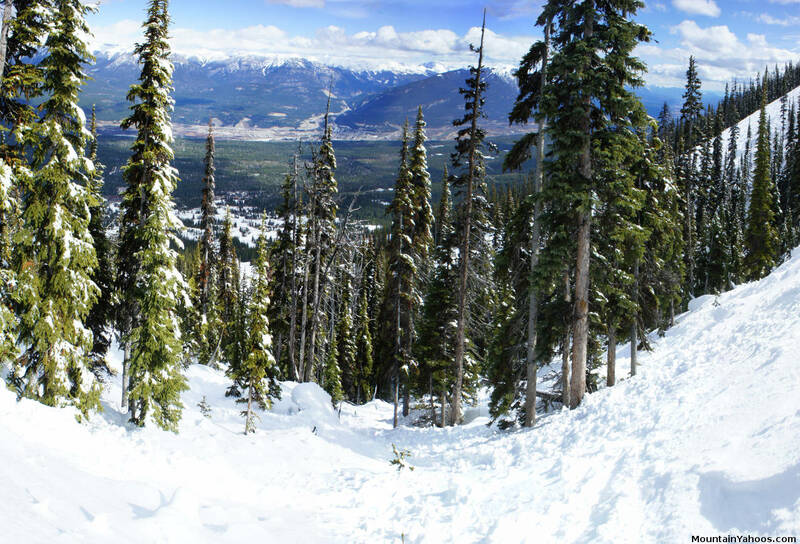 The terrain of Kicking Horse ski resort includes four upper bowls above the tree line, mostly rated as advanced (there is an easy way down for the rest) with a lower resort cut through the forest with runs for all levels. Don't be disappointed when you arrive as you can not see the bowls from the base. All you will be able to see are the tail ends of trails to the base. The bowls are up on top and require a gondola ride to get there. While you ascend, you will first notice that the terrain changes as well as the snow. The powdery light snow is usually preserved days after a snowfall at the upper elevations. The gondola will take you to the middle peak from where one can ski all four upper bowls. Feuz Bowl requires a short hike up to the peak of Blue Heaven to access its terrain. Super bowl requires a short and simple traverse and short hike behind Terminator Peak. All four bowls can take days to fully explore. 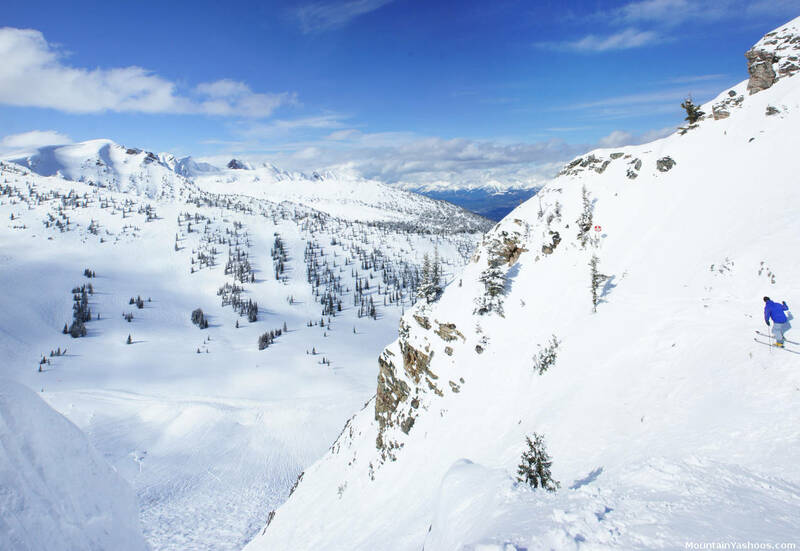 Explore the virtual tour of the four upper bowls of Kicking Horse, a series of fourteen linked spherical panoramic images. The longest trail on the mountain is the green run "It's a Ten", running from the top of the gondola to the base. 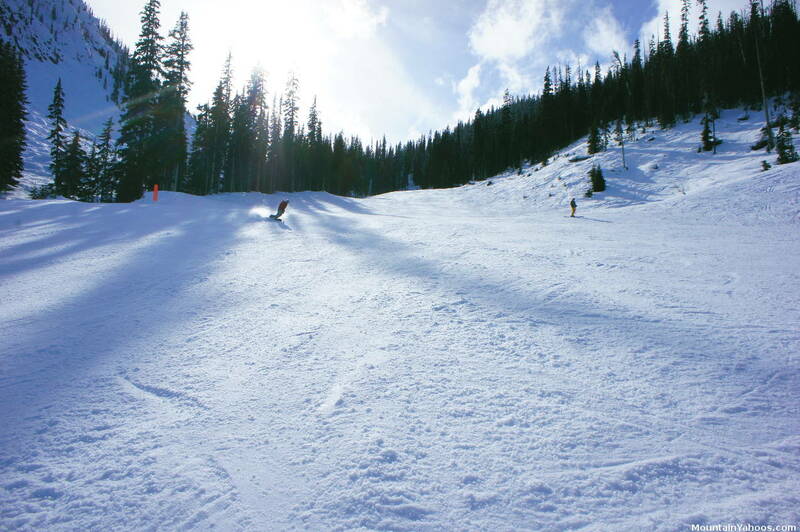 The only intermediate "blue run" in the upper bowls is "Cloud Nine", accessible from the Stairway to Heaven lift. These are the only two easy runs (start to finish) on the upper half of the mountain. All other beginner and intermediate access to the mountain requires that you restrict yourself to the lower half of the mountain riding the lifts Catamount and Pioneer, available from the base of the mountain. The advanced skier will want to explore the terrain of the upper bowls. 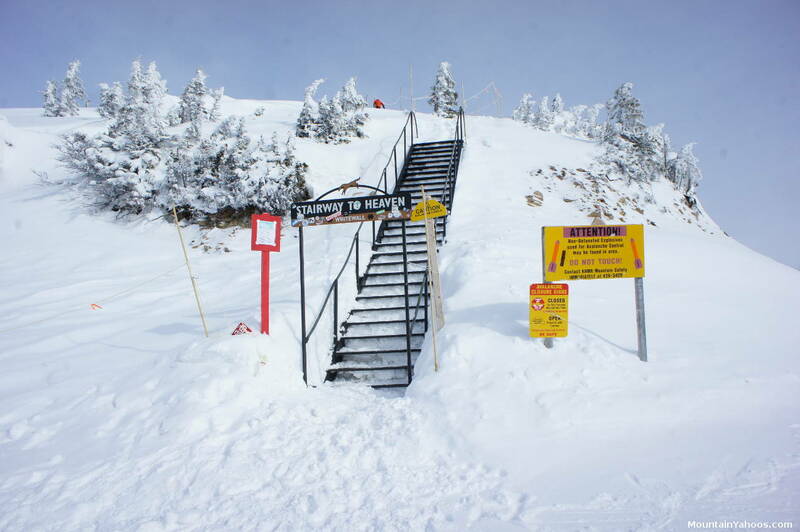 With over 85 chutes and lots of steep double black diamond runs, this is an advanced skier's or advanced boarder's dream. 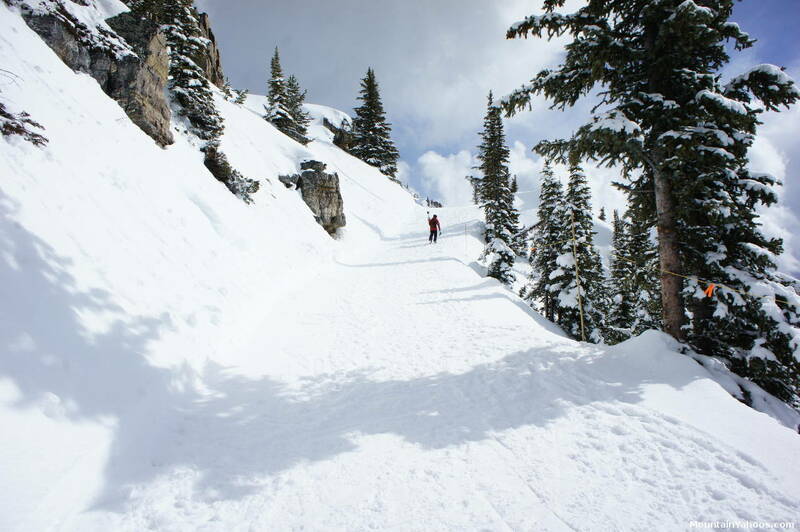 Whitewall, a double black diamond run from the peak of Blue Heaven requires a hike up the "Stairway to Heaven". 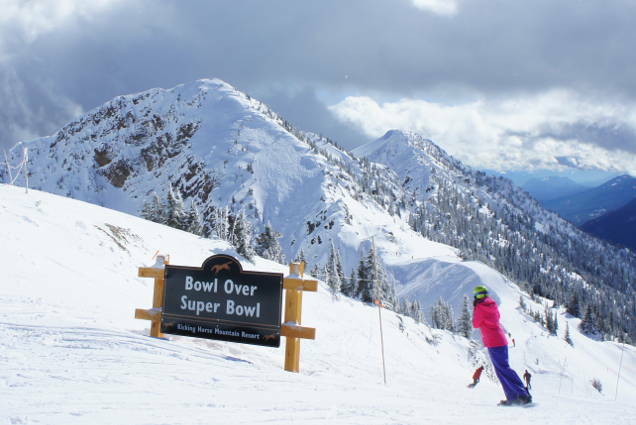 Super Bowl requires passage around Terminator Peak. Follow the trail and short hike. Trail around the back side of "Terminator Peak"
Hike around the back side of "Terminator Peak" to get to "Super Bowl"
Kicking Horse has an abundance of trees at the lower elevations below the tree line. They are not marked trails, not maintained or cleared and thus one must be vigilant against hazards - ski with friends and only when there is enough ground coverage. Most of these tree runs are accessible off of the green run "It's a Ten". You must explore the mountain to find these gems. Tree runs off of the trail "It's a Ten"
Chutes and trees off of the ridge in Crystal Bowl. The upper bowls have few trees. 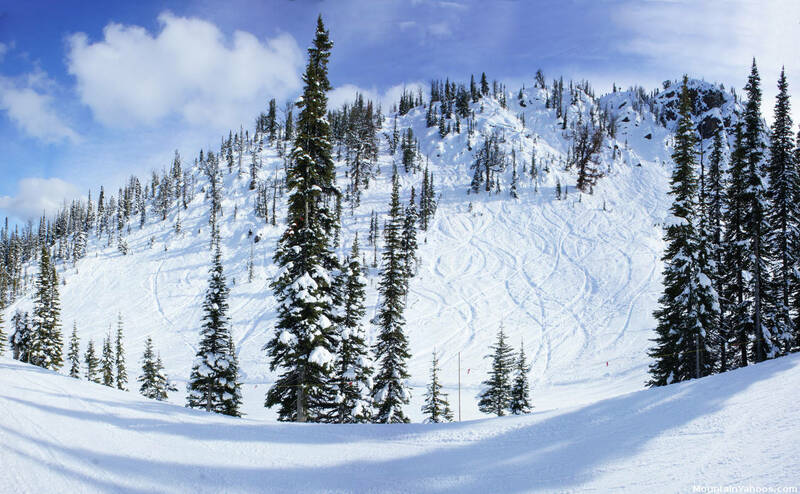 The mogul runs are most predominant on the black diamond runs on the lower part of the mountain below the tree line. The upper bowls have too much open space which allows skiers to find new lines. The trails cut through the forest in the lower part of the mountain funnel all skiers down the same lines forming moguls. 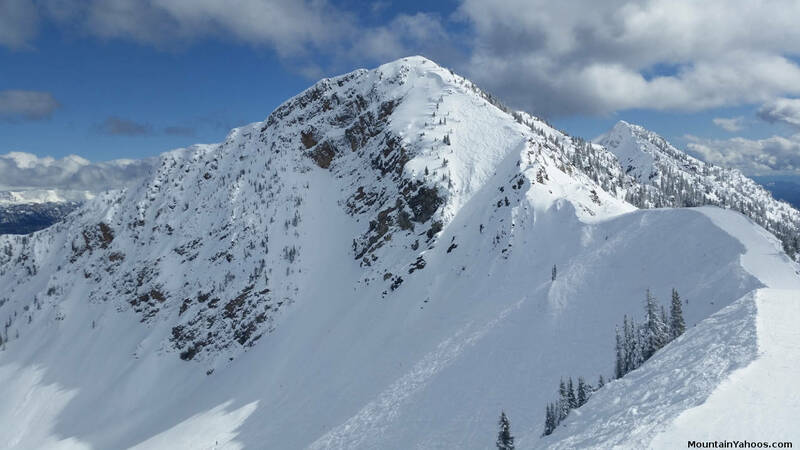 As with most resorts, they warn that the back country is not patrolled, there is no avalanche mitigation and you are on your own in potentially dangerous terrain. That said, Rudi's bowl is North and outside the resort boundary just over the ridge from Feuz Bowl and a short hike from the top of "Stairway to Heaven". It can be skied so that one returns in-bounds at the resort. The Molar's Bowl ridge-line is visible from Eagle's Eye restaurant at the top of the gondola and is located one bowl beyond Rudi's Bowl. Just hike further to get there. Dogtooth Bowl is an even further hike beyond Molar's Bowl to the next bowl. 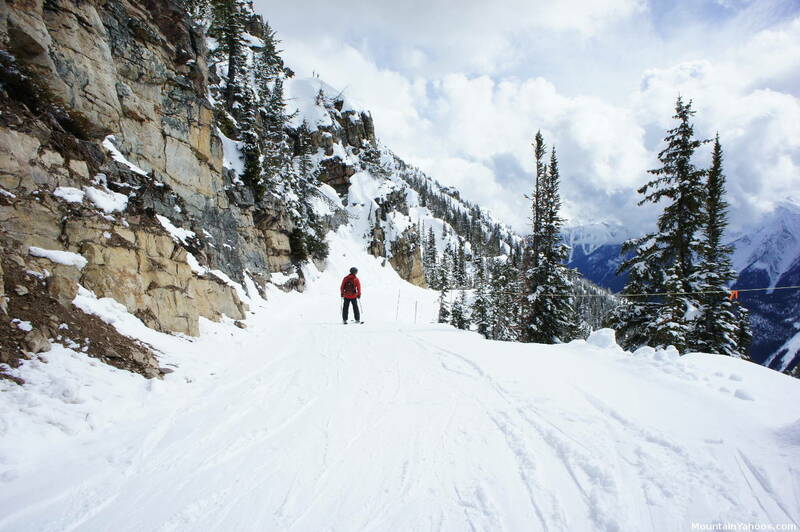 The skiing here is of the most extreme nature with very jagged rock formations. If one heads South in the other direction past Super Bowl past Terminator 2 peak, you will hike to the appropriately named T3 and T4 peaks which will feed back to the valley floor. 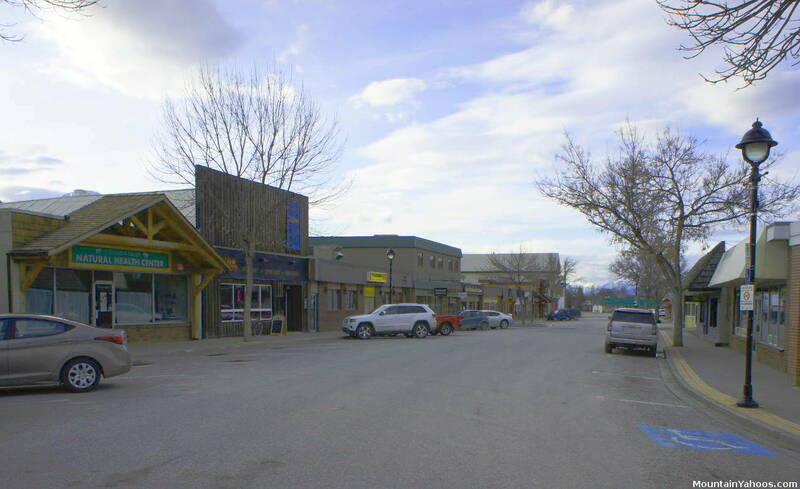 Local town of Golden and mountain base can adequately provide your accommodation and amenities. Poor souvenir t-shirt selection at the base store. Proximity to an international airport. Calgary International Airport is 180 miles away. There is one terrain park on the green run "Beaver Tail", named after the uniquely Canadian sweet treat. There are only a few features and the difficulty is targeted for kids to play on. One doesn't travel to Kicking Horse for the terrain park. The facilities at the base of the mountain can take care of basic skiing and snowboarding needs. Equipment sports shops, rentals, ski instruction, a restaurant and cafe can be found in the mountain base village. The town of Golden can of course offer you more lodging, dining and service options. Golden is a rather simple and small town which offers more services than the mountain base, but one must have modest expectations. Golden still has the ambiance of the mountain mining town from which it evolved.